'Intrusive Brief' (1970). 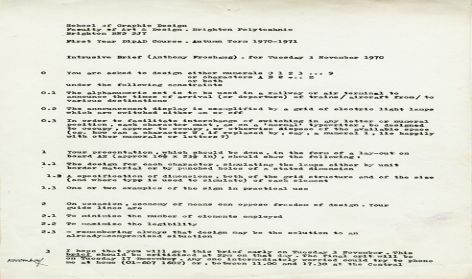 A brief by Froshaug to Brighton Polytechnic First Year DipAD Course. Uncatalogued (AFG/2). 'Portrait' (no date). Uncatalogued (AFG-6). 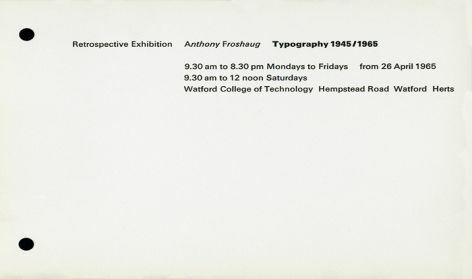 'Retrospective Exhibition' (1965). Exhibition times at the Watford College of Technology. Uncatalogued (AFG-8). 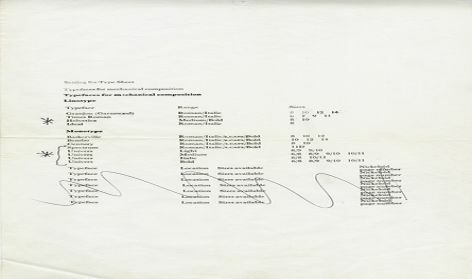 'Type Samples' (no date). Uncatalogued (AFG-1). Anthony Froshaug (1920 -1984) studied at the Central School of Arts & Crafts in London in the 1930s. He established himself as a freelance printer, typographer and exhibition designer influenced by the progressive European typography of Jan Tschichold whose work he sought to publish in Britain. Froshaug taught at the Central School of Arts & Crafts, the Hochschule fur Gestaltung Ulm, the Royal College of Art, and Watford School of Art. 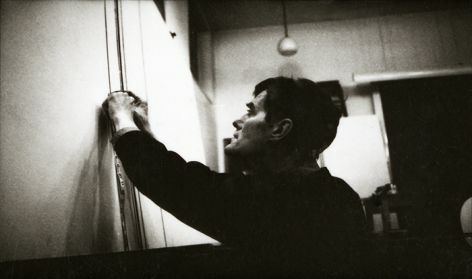 The Froshaug archive documents both his design practice and his pedagogy.